Napkin rings sold in sets of four. Click image to enlarge. This set of four napkin rings features lovely beaded edges. Made of solid brass with a heavy silver plating. These napkin rings are larger than our standard 1601 rings, with a diameter of roughly 2-1/8 inches, when measuring from the outside of the ring. 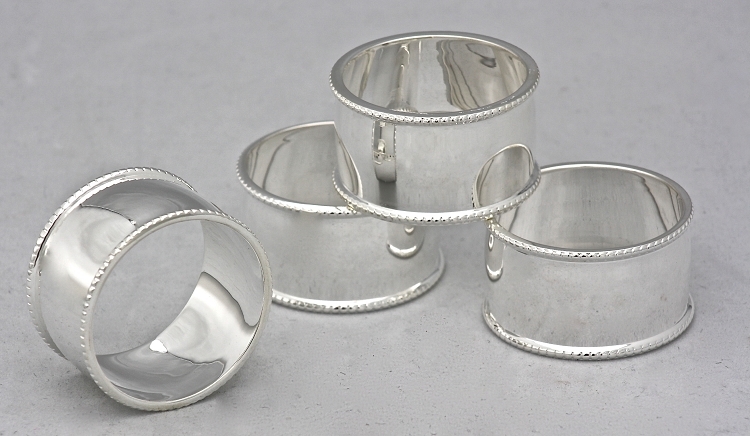 The silver plated napkin rings are about 1-1/4 inches tall, and weigh 2 ounces per ring. These are treated with an anti-tarnish finish to keep them shining. Sold as a set of four. Also available in Polished Brass. After purchasing some silver saucer based candlesticks (that I love), I decided to spring for some silver beaded napkin rings. They arrived today and I can''t be more pleased. I can''t wait for my next formal dinner party so I can show them off. Gorgeous!